The year before I went to act at the Shakespeare Theatre Company* in Washington, D.C., I caught one of their productions which featured a beautiful and well known film actress I will call the Star. My friends in the show each had something to say about her: She was unpredictable, tempestuous, troubled and passionate. What I discovered later is that she is also funny. Okay, I didn’t say it out loud. “You should have!” cried one of my friends in the cast upon hearing this. “She would have loved it–you probably would have become her best friend for life.” Pondering that, I decided the Star would at least have had more fun if had chosen to spar with her. After all, she was an actress in the show just like anyone else. Instead I cast my eyes downward in the face of her fame and mumbled something innocuous. Oh, what a coward! At the time I wasn’t really what talent agent Damon Jones of Portland’s Actors in Action calls a “people person.” The successful actor needs to be friendly and confident. It’s important to meet people where they are. But how do you become a “people person” if you’re not one? 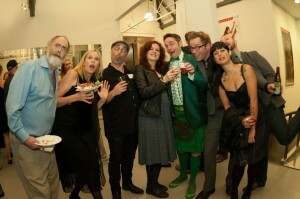 Partying it up with Portland’s finest at the Oregon Actor Awards in October 2014. Photo by Melody Saunders. And by then I do. *The Shakespeare Theatre Company (STC) won the Tony in 2012 and has won more Helen Hayes Awards than any other theatre. STC is sometimes referred to lovingly as “the Folger” because they used to perform at the Folger Shakespeare Library. This entry was posted in Acting, All, Directing, Self Identity and tagged actors, directors, giving, identity, Oregon. Bookmark the permalink. Great commentary. This is something I am working so hard on. I have always had a hard time with small talk in large groups. Grateful you sat at my table and people person’d with me. My pleasure! It was nice to meet you.